It may sound odd to hear that teenagers are made to devote their best years to an exam. In the United States, of course, there are also standardized tests for college admission, such as the SAT and ACT. But their importance for Americans hardly rivals what the formidable gaokao represents for Chinese. The difference, in fact, is fundamental. Unlike the SAT or ACT which only serves as one of the many factors for college admission in the United States, the gaokao scores in China are practically the exclusive determinant. But the difference between China’s and America’s pre-college education systems is actually far deeper than that. Even one of the world’s most intelligent individuals, renowned theoretical physicist Stephen Hawking, seems to have little clue. Forwarded over 170,000 times, Prof. Hawking’s inspiring words became one of the hottest Weibo posts for the next week. Many left messages expressing their excitement at having received the blessings of one of the greatest minds in modern science. Indeed, it sounds like we should be inspired. But if Prof. Hawking knew more about how the system in China works, he probably wouldn’t have spoken of the gaokao in such inspiring terms. China’s gaokao system has been heavily criticized for precisely the manner in which it is seen to actually discourage creativity, academic excellence, big thinkers, and thought leaders. Rather, it has the opposite goal, critics say: It trains teenagers to follow “standard answers” given by teachers through a mandatory and highly-intensive exam preparation process. As a result, students lose much of their capacity to think independently, as well as the courage to challenge authority. In other words, students are instilled with the idea that they should always be obedient to the government and the Party, even if it’s something to which their conscience objects. This is clear when it comes to China’s “political study,” which is a disguised name for Marxist theory. Chinese students take mandatory Marxist theory courses from elementary school through to their Ph.D. programs. Elementary-level political courses are called “ideological and moral education” (思想品德)—but all of the Party line fits under this rubric. It’s in these classes, for instance, that students are indoctrinated with hate propaganda against their fellow Chinese, like practitioners of Falun Gong, the traditional meditation discipline, or those identified as somehow politically unreliable. A hot article during this year’s gaokao season compares the topics of essay writing in China and France with the title “China’s Essay Writing Education Lowers the Whole Nation’s IQ.” The article lists what French students in the natural or social sciences were asked to write about in high school exams, including topics like “Is it a moral responsibility to respect all kinds of lives?” and “Do humans live for happiness?” The French students were also given three optional topics, allowing them to reflect on an excerpt from classical literature or philosophy. An essay writing problem in China’s 2016 ​g​aokao. Students are asked to write an essay of over 800 words based on content of a comic. Controversial as it is, the article was echoed by many social media users. Remarks included: “They [the Party] never want to you to think,” “The ability to think clearly is the enemy of dictatorship,” “How will the Party be able to deceive if you can think independently? Education only serves as a brainwashing tool for it,” and more. Aside from the students, the other major constituency invested in the gaokao are Chinese parents, who often care more about the outcome than their son or daughter. Under the single-child policy and with a heavily family-centered culture, a child’s failure in the gaokao is sometimes seen as the failure of the whole family. In addition, despite the unfairness imposed on people from inner provinces, the gaokao is still regarded by ordinary Chinese as the fairest path to a better life. “Get a good score in the gaokao, go to a good college and find a good job,” is a simple but truthful summary of parental instruction. But there were some irrational behaviors by “gaokao parents” this year. On June 9, two parents in Jiangsu Province smashed a vehicle’s front light to prevent it from alarming, which they said was interfering with their child’s rest. There are also reports of gaokao parents temporarily blocking traffic during the English listening test, to “make it free of traffic noise.” Violence erupted between the road-blocking parents and a motor rider, and was captured in a video. 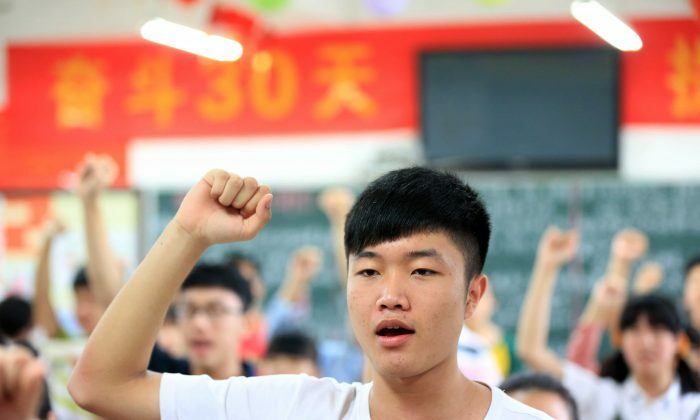 Headlines also noted a “gaokao expedition” in Maotangchang, a secluded town in Anhui Province known as “Asia’s Biggest Gaokao Factory.” Tens of thousands of people gathered to see high school seniors off to the “frontlines” of the gaokao. Clearly, the exam is like a war to rural Chinese families.